Their eleven-year-old son, Hudson, is struggling at school: he's socially awkward and not fitting in. Don's spent a lifetime trying to fit in--so who better to teach Hudson the skills he needs? The Hudson Project will require the help of friends old and new, force Don and Rosie to decide how much to guide Hudson, and raise some significant questions about Don's own identity. Meanwhile, there is the Genetics Lecture Outrage, Rosie's troubles at work, Don's estrangement from his best friend Gene... And opening the world's best cocktail bar. Graeme Simsion is an Australian novelist and screenwriter. His debut, The Rosie Project has sold over three million copies worldwide. 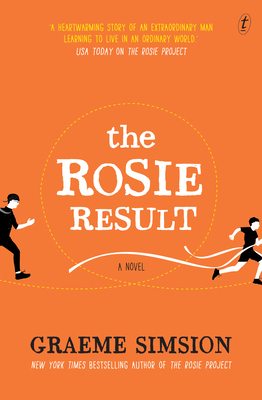 The sequel, The Rosie Effect, is also a bestseller, with worldwide sales of more than a million copies. Graeme's screenplay for The Rosie Project is in development with Sony Pictures and The Best of Adam Sharp is in development with Toni Collette's Vocab Films. Graeme's latest novel is Two Steps Forward, (Oct, 2017) co-written with his wife, Anne Buist.